They make for a fabulous appetizer, side dish, or if you make them bigger. Two of these patties can be your lunch or sensible dinner with a salad on the side. 3 cups Sweet potato, about 1 large-2 medium potatoes, stemmed and pureed. 1/2 cup Panko Japanese style breadcrumbs, or any kind of plain bread crumbs. If you have gluten allergies, ground old fashion oats or almond meal will work. 1. Devein the Kale, make it into a tight roll and chop chiffonade style. 3. In a medium size pan heat up about 4-6 tablespoons of grape seed oil, peanut oil or coconut oil. With a small Ice cream scooper scoop about 6 patties into the pan and slightly flatten the tops. Cook for about 3-4 minutes on each side or until golden brown. 4.Cool them on a rack. 5. Mix all ingredients of the dipping sauce on a small bowl. 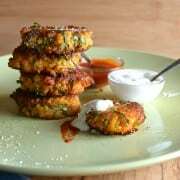 Serve fritters while warm or at room temperature, with the ginger sauce on the side and some hot sauce of your preference. I highly recommend Sriracha…I love it….Enjoy!